A highly sensitive temperature sensor based on an all-fiber Sagnac loop interferometer combined with metal-filled side-hole photonic crystal fiber (PCF) is proposed and demonstrated. PCFs containing two side holes filled with metal offer a structure that can be modified to create a change in the birefringence of the fiber by the expansion of the filler metal. Bismuth and indium were used to examine the effect of filler metal on the temperature sensitivity of the fiber-optic temperature sensor. It was found from measurements that a very high temperature sensitivity of −9.0 nm/°C could be achieved with the indium-filled side-hole PCF. The experimental results are compared to numerical simulations with good agreement. It is shown that the high temperature sensitivity of the sensor is attributed to the fiber microstructure, which has a significant influence on the modulation of the birefringence caused by the expansion of the metal-filled holes. B. Lee, “Review of the present status of optical fiber sensors,” Opt. Fiber Technol. 9, 57–79 (2003). B. Culshaw and A. Kersey, “Fiber-optic sensing: a historical perspective,” J. Lightwave Technol. 26, 1064–1078 (2008). J. M. López-Higuera, L. Rodriguez Cobo, A. Quintela Incera, and A. Cobo, “Fiber optic sensors in structural health monitoring,” J. Lightwave Technol. 29, 587–608 (2011). G. Wehrle, H. J. Kalinowski, P. I. Torres, and L. C. Guedes-Valente, “Fibre optic Bragg grating strain sensor used to monitor the respiratory spectrum,” Proc. SPIE 4185, 310–313 (2000). Y. Wang, D. N. Wang, C. R. Liao, T. Hu, J. Guo, and H. Wei, “Temperature-insensitive refractive index sensing by use of micro Fabry–Perot cavity based on simplified hollow-core photonic crystal fiber,” Opt. Lett. 38, 269–271 (2013). Y. Zou, X. Dong, G. Lin, and R. Adhami, “Wide range FBG displacement sensor based on twin-core fiber filter,” J. Lightwave Technol. 30, 337–343 (2012). P. Torres, E. Reyes-Vera, A. Díez, and M. V. Andrés, “Two-core transversally chirped microstructured optical fiber refractive index sensor,” Opt. Lett. 39, 1593–1596 (2014). A. D. Kersey, M. A. Davis, H. J. Patrick, M. LeBlan, K. P. Koo, C. G. Askins, M. A. Putnam, and E. Friebele, “Fiber grating sensors,” J. Lightwave Technol. 15, 1442–1463 (1997). Y. Zou and X. Dong, “Demodulation of the FBG temperature sensor with the tunable twin-core fiber,” Microwave Opt. Technol. Lett. 53, 81–84 (2011). V. Bhatia and A. M. Vengsarkar, “Optical fiber long-period grating sensors,” Opt. Lett. 21, 692–694 (1996). A. N. Starodumov, L. A. Zenteno, D. Monzon, and E. De La Rosa, “Fiber Sagnac interferometer temperature sensor,” Appl. Phys. Lett. 70, 19–21 (1997). Y. Liu, B. Liu, X. Feng, W. Zhang, G. Zhou, S. Yuan, G. Kai, and X. Dong, “High-birefringence fiber loop mirrors and their applications as sensors,” Appl. Opt. 44, 2382–2390 (2005). O. Frazão, J. M. T. Baptista, and J. L. Santos, “Recent advances in high-birefringence fiber loop mirror sensors,” Sensors 7, 2970–2983 (2007). X. Dong, H. Y. Tam, and P. Shum, “Temperature-insensitive strain sensor with polarization-maintaining photonic crystal fiber based Sagnac interferometer,” Appl. Phys. Lett. 90, 1511131 (2007). Y. Geng, X. Li, X. Tan, Y. Deng, and Y. Yu, “High-sensitivity Mach–Zehnder interferometric temperature fiber sensor based on a waist-enlarged fusion bitaper,” IEEE Sens. J. 11, 2891–2894 (2011). R. Yang, Y. S. Yu, Y. Xue, C. Chen, C. Wang, F. Zhu, B. L. Zhang, Q. D. Chen, and H. B. Sun, “A highly sensitive temperature sensor based on a liquid-sealed S-tapered fiber,” IEEE Photon. Technol. Lett. 25, 829–832 (2013). S. H. Lee, B. H. Kim, and W. Han, “Effect of filler metals on the temperature sensitivity of side-hole fiber,” Opt. Express 17, 9712–9717 (2009). B. H. Kim, S. H. Lee, A. Lin, C. Lee, J. Lee, and W. Han, “Large temperature sensitivity of Sagnac loop interferometer based on the birefringent holey fiber filled with metal indium,” Opt. Express 17, 1789–1794 (2009). B. H. Kim, S. Lee, D. H. Son, T. Ahn, S. Kim, and W. Han, “Optical properties of the fiber-optic temperature sensor based on the side-hole fiber filled with indium,” Appl. Opt. 52, 666–673 (2013). J. Jason, P. Rugeland, O. Tarasenko, W. Margulis, and H. Nilsson, “Temperature characteristics of the birefringence properties of filled side-hole fibers,” Appl. Opt. 52, 5208–5215 (2013). W. Qian, C.-L. Zhao, S. He, X. Dong, S. Zhang, Z. Zhang, S. Jin, J. Guo, and H. Wei, “High-sensitivity temperature sensor based on an alcohol-filled photonic crystal fiber loop mirror,” Opt. Lett. 36, 1548–1550 (2011). D. J. J. Hu, J. L. Lim, Y. Cui, K. Milenko, Y. Wang, P. P. Shum, and T. Wolinski, “Fabrication and characterization of a highly temperature sensitive device based on nematic liquid crystal-filled photonic crystal fiber,” IEEE Photon. J. 4, 1248–1255 (2012). K. Naeem, B. H. Kim, B. Kim, and Y. Chung, “High-sensitivity temperature sensor based on a selectively-polymer-filled two-core photonic crystal fiber in-line interferometer,” IEEE Sens. J. 15, 3998–4003 (2015). M. Yang, D. N. Wang, Y. Wang, and C. R. Liao, “Fiber in-line Mach–Zehnder interferometer constructed by selective infiltration of two air holes in photonic crystal fiber,” Opt. Lett. 36, 636–638 (2011). Y. Xin, X. Dong, Q. Meng, F. Qi, and C.-L. Zhao, “Alcohol-filled side-hole fiber Sagnac interferometer for temperature measurement,” Sens. Actuators A Phys. 193, 182–185 (2013). H. Liang, W. Zhang, H. Wang, P. Geng, S. Zhang, S. Gao, C. Yang, and J. Li, “Fiber in-line Mach–Zehnder interferometer based on near-elliptical core photonic crystal fiber for temperature and strain sensing,” Opt. Lett. 38, 4019–4022 (2013). 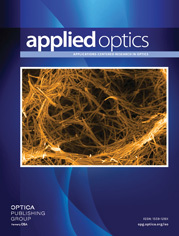 E. Reyes-Vera, G. Chesini, C. M. Cordeiro, and P. Torres, “Large temperature sensitivity of birefringent side-hole photonic crystal fiber filled with Indium,” in Workshop on Specialty Optical Fibers and their Applications (Optical Society America, 2013), Vol. 1, paper W3.16. E. Reyes-Vera, N. D. Gómez-Cardona, G. Chesini, C. M. B. Cordeiro, and P. Torres, “Temperature sensibility of the birefringence properties in side-hole photonic crystal fiber filled with Indium,” Appl. Phys. Lett. 105, 201101 (2014). E. Reyes-Vera and P. Torres, “Influence of filler metal on birefringent optical properties of PCF with integrated electrodes,” J. Opt. 18, 085804 (2016). D. R. Lide, CRC Handbook of Chemistry and Physics, 1st ed. (CRC Press, 2005). D. W. Kim, Y. Zhang, K. L. Cooper, and A. Wang, “In-fiber reflection mode interferometer based on a long-period grating for external refractive-index measurement,” Appl. Opt. 44, 5368–5373 (2005). X. Li, S. Lin, J. Liang, Y. Zhang, H. Oigawa, and T. Ueda, “Fiber-optic temperature sensor based on difference of thermal expansion coefficient between fused silica and metallic materials,” IEEE Photon. J. 4, 155–162 (2012). N. Zhao, H. Fu, M. Shao, X. Yan, H. Li, Q. Liu, H. Gao, Y. Liu, and X. Qiao, “High temperature probe sensor with high sensitivity based on Michelson interferometer,” Opt. Commun. 343, 131–134 (2015). J. Zhang, X. Qiao, T. Guo, Y. Weng, R. Wang, Y. Ma, Q. Rong, M. Hu, and Z. Feng, “Highly sensitive temperature sensor using PANDA fiber Sagnac interferometer,” J. Lightwave Technol. 29, 3640–3644 (2011). Y. Cui, P. P. Shum, D. J. J. Hu, G. Wang, G. Humbert, and X.-Q. Dinh, “Temperature sensor by using selectively filled photonic crystal fiber Sagnac interferometer,” IEEE Photon. J. 4, 1801–1808 (2012). J. Xie, B. Xu, Y. Li, J. Kang, C. Shen, J. Wang, Y. Jin, H. Liu, K. Ni, X. Dong, C. Zhao, and S. Jin, “High-sensitivity temperature sensor based on a droplet-like fiber circle,” Appl. Opt. 53, 4085–4088 (2014). Fig. 1. Scanning electron microscope (SEM) images of the cross section of the side-hole PCF used in this study with different filler metals: (a) unfilled, (b) Bi, and (c) In, respectively. (d) Experimental setup of the SLI temperature sensor based on metal-filled side-hole PCF. Fig. 2. Transmission spectra of the SLI based on side-hole PCF without and with metal at room temperature ( ∼ 22 ° C ). The spectra were shifted vertically for clarity. Fig. 3. Transmission spectra of the SLI based on side-hole PCF filled with (a) Bi; (b) In. The spectra were shifted vertically for clarity. The red line shows the wavelength shift. Fig. 4. Wavelength shift of the interference fringe of the SLI temperature sensor based on metal-filled side-hole PCF with L T ∼ 22 cm and L temp ∼ 8 cm . (a) PCF filled with Bi; (b) PCF filled with In. Fig. 5. Interference fringe spacing near 1310 nm of the SLI temperature sensor based on metal-filled side-hole PCF with L T = 22 cm and L temp = 8 cm . Fig. 6. Computed stress distributions along horizontal ( x ) and vertical ( y ) axes for the side-hole PCF filled with (a) Bi and (b) In at 45°C. Fig. 7. Numerical results of group birefringence of the side-hole PCF filled with (a) Bi and (b) In as a function of the temperature for two representative wavelengths. Fig. 8. Theoretical wavelength shift of the interference fringe of the SLI temperature sensor based on the side-hole PCF filled with (a) Bi and (b) In.